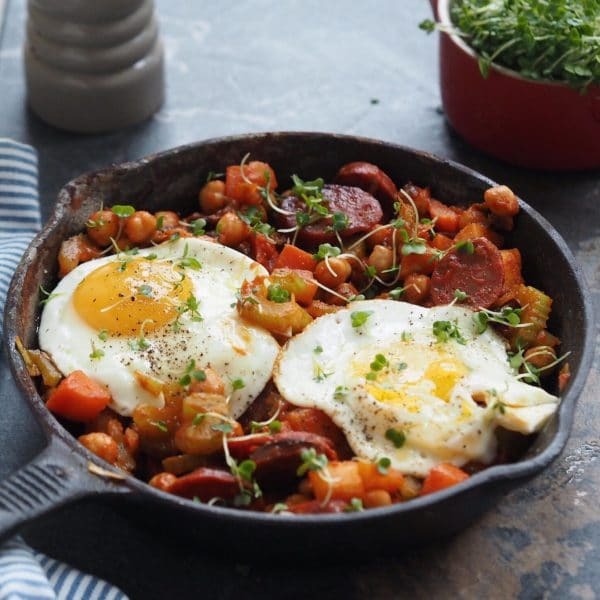 Try this delicious Sweet Potato & Chorizo Hash recipe! Peel the sweet potatoes and chop into 2cm cubes. Put the cubes into a pan and cover with water, then bring to the boil. Once boiling, drain and allow the steam to run off. While waiting, melt the coconut oil in a pan over a medium to high heat. Once melted, add the chopped onions and chorizo/pancetta, and fry for 3-4 minutes, stirring occasionally. Next, turn the heat down to medium and add the sweet potatoes, chickpeas, jalapenos, sea salt and black pepper. Squash them down a little and fry for 8-10 minutes without moving them, until the bottom becomes crispy. Once crispy, pour the passata, then make 2 small wells in the hash and break in the eggs. Cover the pan with a lid and cook for 2-3 minutes until the eggs are cooked but the yolk is still runny (you can cook for longer if you like your yolks well-done). Top with a few extra jalapeños and serve.